All Christian parents have a God-given desire to dedicate their child to the Lord. Jesus said in Matthew 19:14, “Let the little children come to Me, and do not hinder them, for the Kingdom of Heaven belongs to such as these.” Therefore, Christian parents desire to bring their children to Christ and receive His blessing. The purpose of baby or child dedication is really to be found in the purpose of the parents. Rightly understood, the ceremony is one of parental dedication. Rather than baptizing infants or children, Waterdam encourages Christian parents to dedicate their children. This is a ceremony in which parents formally call upon God’s blessing for their child and publicly commit to raise him or her in accordance with Scripture. What does Child Dedication mean? Child dedication means several things. It means that we understand that children are gifts from God, and that we, as parents, are stewards of God’s good gift. As parents, we dedicate ourselves to God, seeking His help and guidance in raising our child to the glory of God. This means we seek to live according to God’s Word and God’s will, and raise our child in the manner God prescribes in the Scriptures. Also, we entrust our child to God and seek His blessing as the child grows toward maturity and adulthood. It is our hope and prayer that our child will respond in faith to the grace of God for salvation and serve God faithfully, passing on their faith to the next generation. In the Scriptures we find parents bringing their children to Jesus. He held them, prayed for them, and told us to welcome them. But He did not baptize them and He did not tell anyone else to baptize them. Waterdam Church believes Baptism is for those who have made a personal decision to trust Christ alone for their salvation, once they have the maturity and ability to understand what that means. (Acts 2:41, 8:12, and 10:47–48). Dedication is not a sacrament; nor does it impart grace or salvation to a child. Salvation comes only through faith in Jesus Christ as each person recognizes their sinfulness and receives forgiveness and eternal life through Christ and His work on the cross. 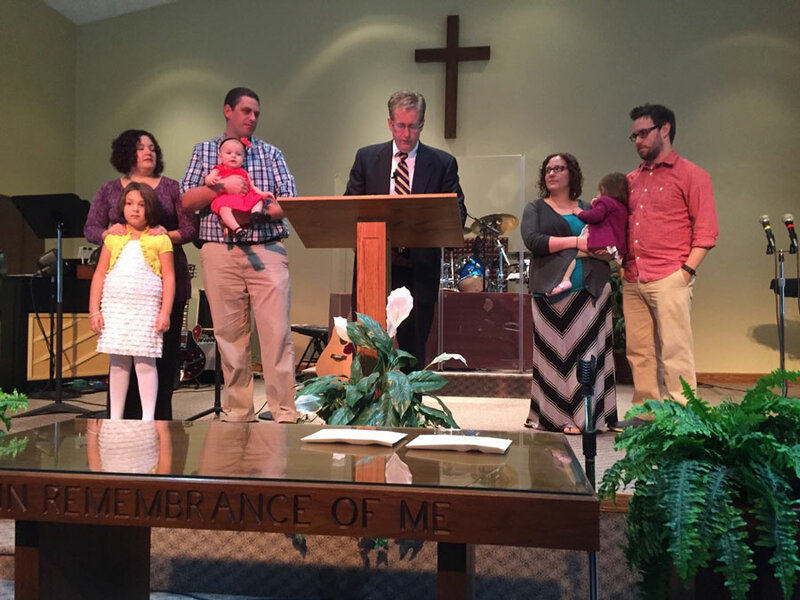 Do I need to be a member of Waterdam Church to dedicate my children? You do not need to be a member of Waterdam Evangelical Free Church to have your child dedicated in a group or public ceremony at Waterdam. We do encourage parents to make sure they are calling Waterdam their home church. Why? In dedicating your child to God, you are stating that you are willing to partner with God and the church to raise your child in cooperation with God’s intentions. To partner with any church, a parent would be wise to decide if he or she agrees with its beliefs and vision, so they can be all-in in their partnership with the church. We ask parents to have a personal relationship with Jesus Christ. We ask parents to consider if their beliefs line up with Waterdam’s statements of belief. We ask parents to be regular attenders of Waterdam’s weekend services. Child Dedication is available to legally married couples, or a single parent. We ask parents who are living together and who are not married to take steps to acknowledge and surrender to God’s plan for their relationship before participating in a child dedication service. If you are a grandparent, other relative, or legal guardian, please contact us first. We are open to having conversations with you on any of the above statements. If you are interested, contact church office (724) 745-2158. Do you here this day recognize this child as the gift of God, and give heartfelt thanks for God’s blessing?•Do you here this day dedicate this child to the Lord who gave him/her?•Do you here this day pledge as parents that you will bring up this child “in the nurture and admonition of the Lord”?•Do you here this day promise to give this child every possible benefit of home, of school, of the church?•Do you here this day ask God’s blessings upon his/her life, to guide, guard and direct him/her through all his/her years? •Do you solemnly promise before God and one another that, with God’s help and guidance, you will support these parents with your promise to assist them by providing encouragement, counsel and ministries to guide them in the ways of godliness? If so answer, “We do”. We do.